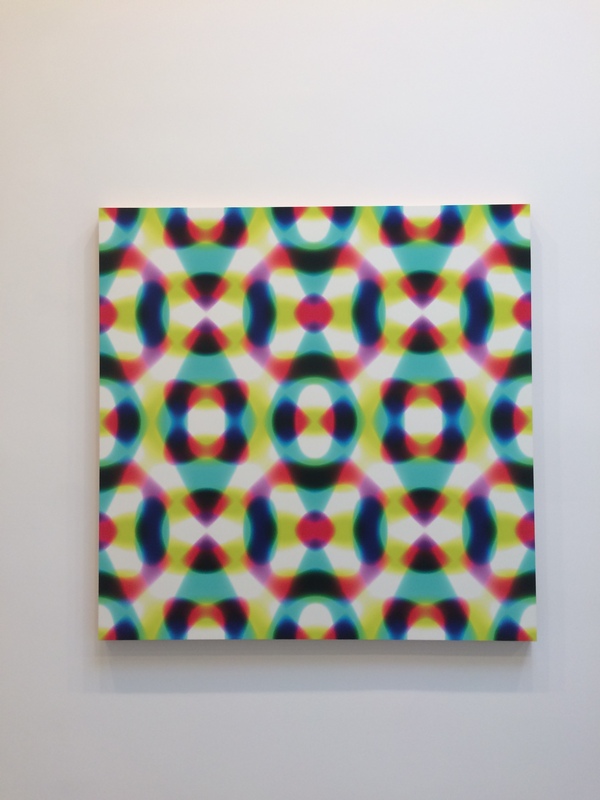 David Zwirner Gallery is currently presenting recent abstract work in Stan Doulas’ “DCT series”. “DCT” refers to discrete cosine transformation. Each composition is created by the artist entering data for frequencies, amplitudes and color. The numerical data is manipulated through a custom computer program. The photographic prints are based solely on this process: there is no physical subject matter. They are printed on stretched and gessoed canvas and take on the form of abstract paintings. “6AA6” from 2017, is a good example of the symmetries created in the geometric patterns created using Douglas’ unique system of image generation. The square canvas features order-4 rotational symmetry with the lines of reflections running along the diagonals. The pattern can also be seen as a tiling made up of squares also positioned diagonally. Each square has one of two different types of geometries in a checkerboard layout. Douglas is well known for more traditional photography, where an actual scene or object is depicted. 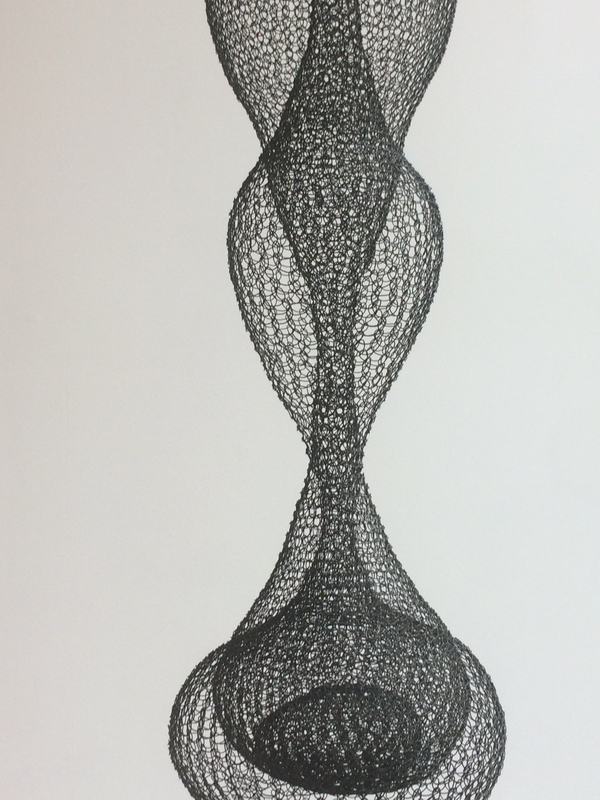 These new techniques allow the artist to create a visual representation of numerical data transformed through technology. 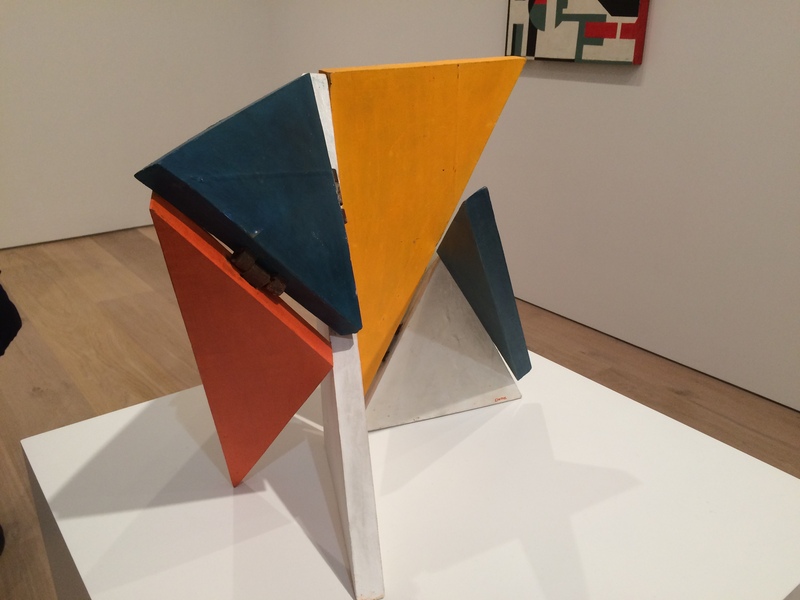 The Group Show Concrete Cuba at the David Zwirner Gallery in Chelsea is an exhibition of historical importance and has been the subject of numerous reviews and editorials. So far I have not read a direct discussion of the Mathematical connections to the art, so here it goes… This exhibition displays the work of a group of Cuban abstract artists who are referred to as Los Diez Pintores Concretos (Ten Concrete Painters). This group was active fro 1959 to 1961, but the show also includes earlier work to explore the development of Concretism, introducing the viewer to art work created at a pivotal and complex time in recent Cuban history. Pure hard edge abstraction was counterintuitively a political statement by striving for a visual utopia instead of expressive political themes. I have selected two works from the extensive exhibition with interesting mathematical subjects. This sculpture “Untitled, Transformable” by Sandú Darié consists of six hinged triangles. Depending on your vantage point in the gallery the structure takes on many different forms. Two hinged vertical rectangle have been split and hinged along parallel diagonals. Then, the two outer right triangles have been split and hinged to form equilateral and isosceles triangles. By using different colors for the elements in each half it is not obvious that each side is the same construction with a 180 degree rotation. The sculpture can take on a multitude of shapes through the use of hinges. The artist has used a fairly direct study of triangles to create a work with about how geometry can be visualized with the viewer moving through space. The next example is also by Sandú Darié. It is a collage work on paper. 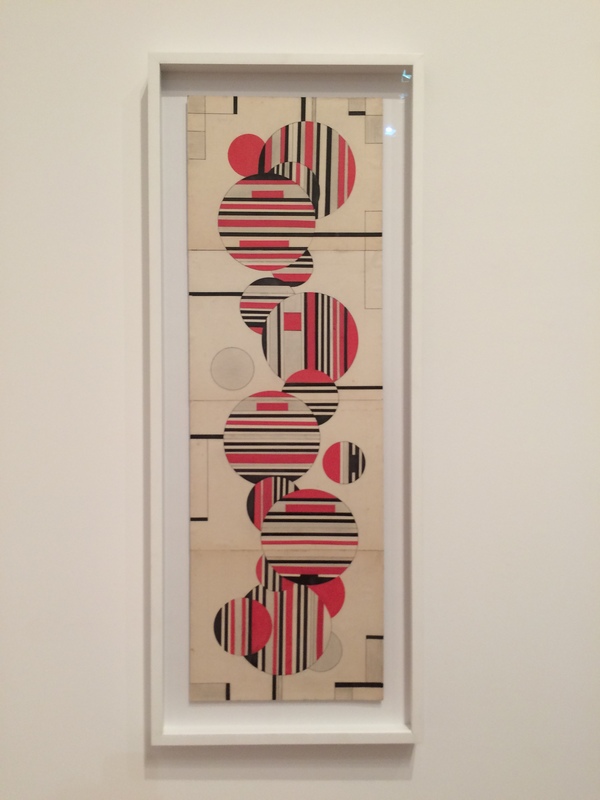 This 1950 work is all about circles. It features a column of overlapping circles. Some of the circles have been divided into red, black and white parallel stripes using vertical chords and some horizontal chords. This makes the circles appear to be twisting 90 degrees back and forth as they tumble down the page. It is the juxtaposition of the linear qualities of the parallel bands of color and the circular cut outs that provide a sense of movement in this dynamic collage. 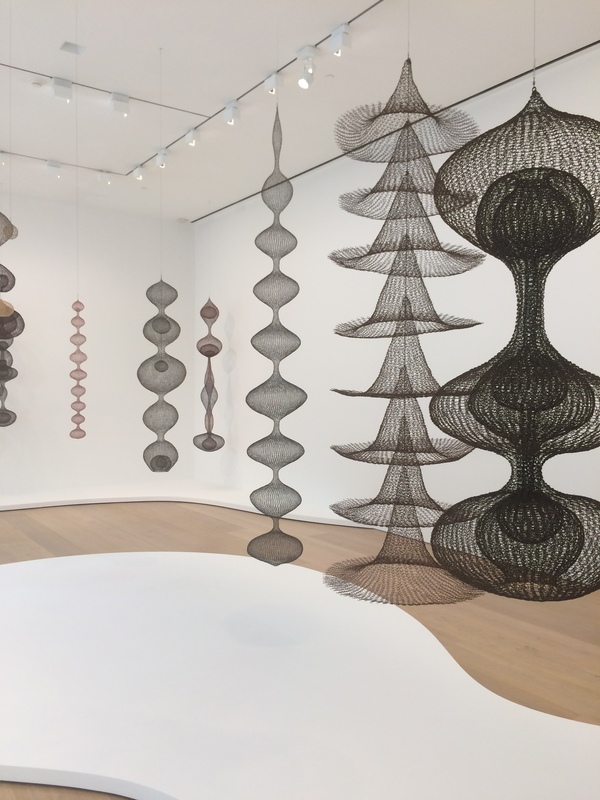 Much of the work on display at this memorable exhibition employed mathematical themes. These were just my favorite pieces. Currently on display Museum of Modern Art, “Scenes for a New Heritage” is a fresh reinstallation of the Museum’s collection of contemporary art. 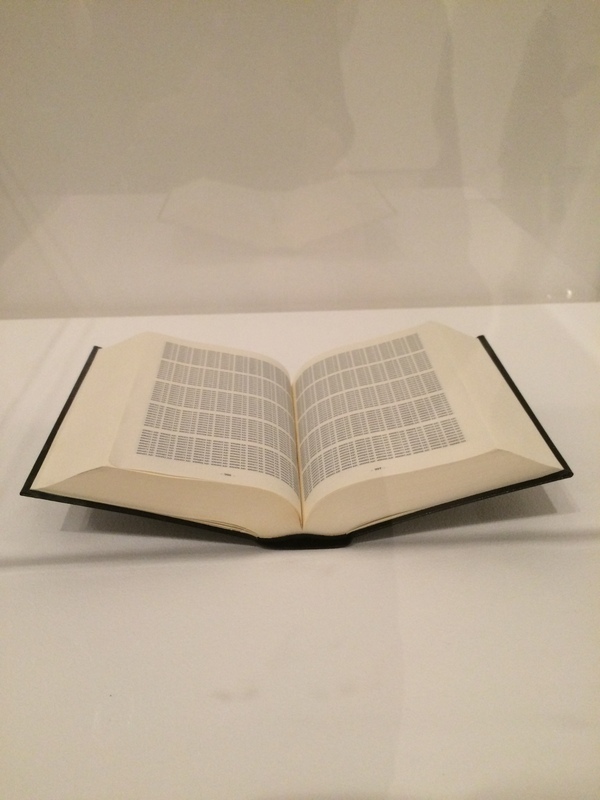 The first work you encounter as you enter the gallery is On Kawara’s “One Million Years (Past and Future)”. A limited edition Artist Book published in 1999 by Editions Micheline Szwajcer and Michele Didier, Brussels. Situated on a white pedestal in a clear vitrine the book features rows and columns of numerical years in sequence from 998,031 BC to 1.001,992 AD. As you get close to the vitrine to study the book, a voice reads out the numbers of a year. There is a speaker in the front of the stand. If you stand close to the pedestal another year in consecutive order is read out. The voice on the recording alternates between male and female. The audio recording was produced by the David Zwirner Gallery NY in 2000. 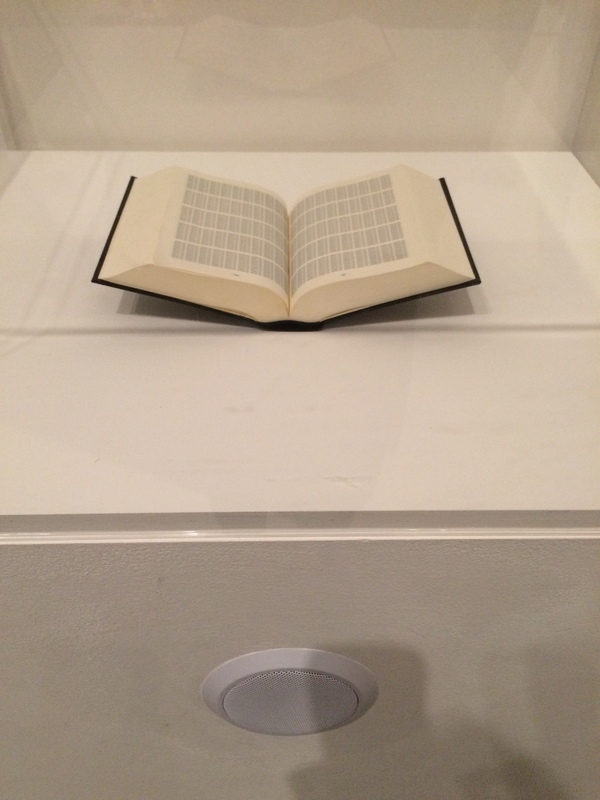 This installation at the MOMA is really two works of art, the visual component in the form of a book and a poetic component in the reading of the dates. On Kawara is very famous for his paintings of single dates on canvas. 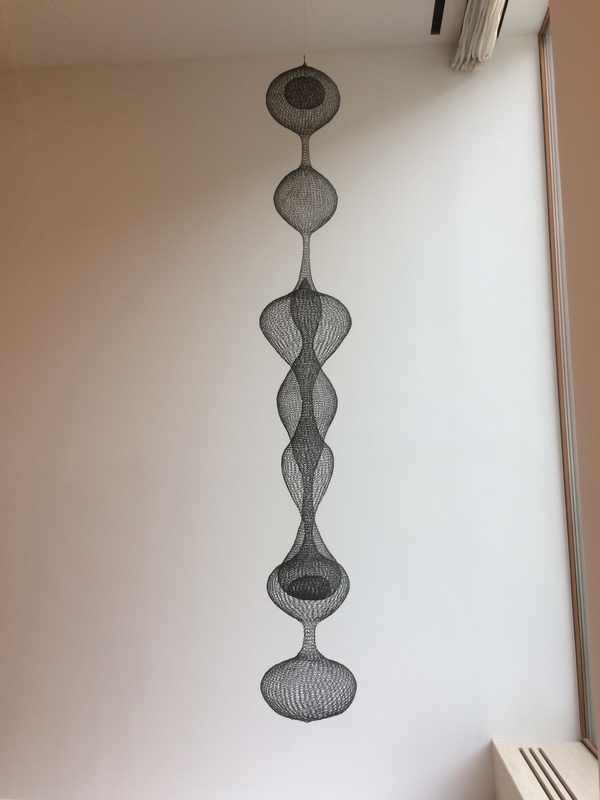 I feel this installation reflects a deeper connection to Mathematics. The emphasis on the listing of numbers makes the viewer think about how we mark time using digits and order. The act of counting to this huge number of one million creates an extremely emotionally charged audio experience. The number are just as poignant as any other words in expressing the vastness and continuity of time.